This 65 Hatteras has had continuous upgrades and maintenance….see the full specs. Continued maintenance was the rule with the 12V71 TA Detroits, too. The current owner has just completed 2018 maintenance to include all new hoses, belts, and filters. 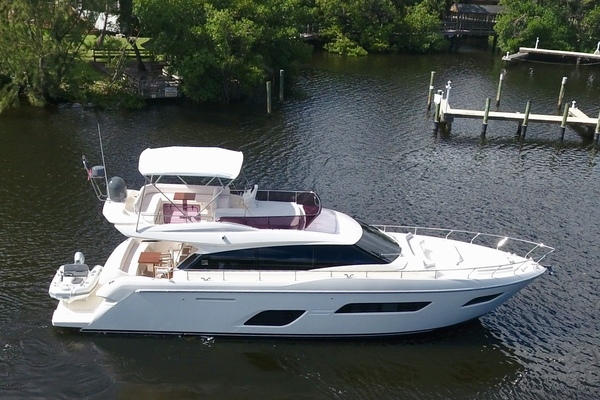 The 65 Hatteras has 4 staterooms and 4 heads. Entertaining areas in the salon and on the bridge make the 65 a great boat for family or business. 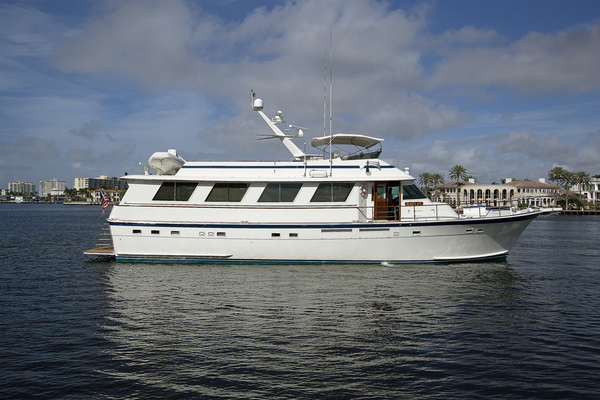 West Florida Yachts would love to guide you through a personal showing of this 65' Hatteras 65 Motor Yacht 1988. This yacht for sale is located in Wickford, Rhode Island and priced at $349,500. For a showing please contact us by filling out the form on this page and we will get back to you shortly! This is a 4 stateroom down layout. The master is aft with king berth, new mattress, new flooring, and private head. The traditional port and starboard engine rooms separate the master from the VIP guest stateroom with queen berth and en-suite head. Continuing forward and up 4 stairs, the second guest stateroom is on port with twin berths and the third head is across on starboard. And then forward and down three steps to the 4th stateroom or crews quarters. Here there are stacked berths to starboard with an upper full size berth and a single below. There is also an en-suite head with shower. The main deck has a small line handling cockpit aft…there is a salon with dining area, entertainment center, and a wet bar. Just forward of the salon is the galley with all new appliances and dinette. Continuing forward, you find the pilothouse with entrances to the forward stateroom and a staircase to the bridge. The bridge is huge with extended bimini. There is a marquipt davit and two cradles for toys. The bridge also features an entertainment center and propane grill. The owner has made several recent upgrades as you have seen in the listing. The engines are recently serviced, and there have been several upgrades including new appliances, new flooring, new bow thruster, and much more. He has his sights on his next boat and is offering this lovely 65 for sale. Please call for an appointment to visit.